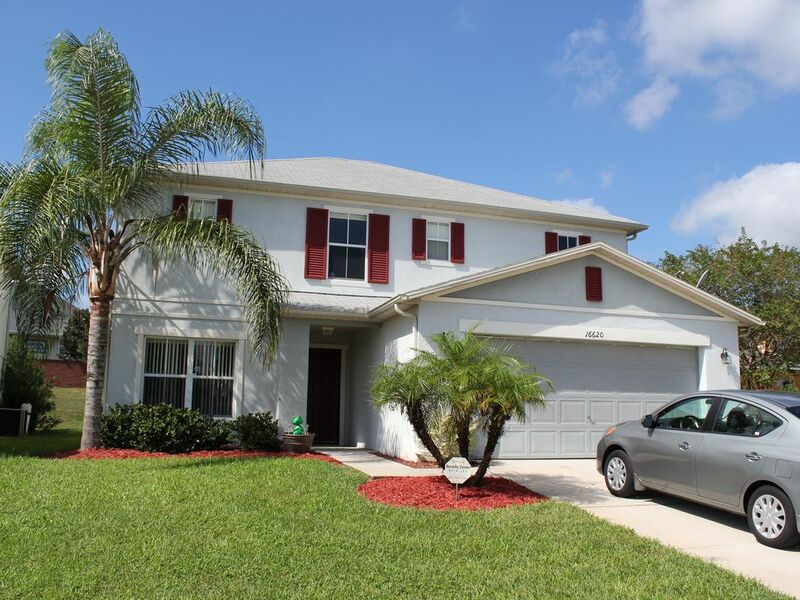 This beautiful 2-story , 4 bedroom vacation home is situated in the desirable Sunrise Lakes development, a sought after community just minutes from the Disney theme parks. It is an attractive and tranquil setting to relax in while on vacation, with a community pool and a playground. Our 2400 square foot home has a spacious main floor with an open concept, including a family room, living room and an eat-in kitchen. The kitchen includes all of the amenities of a home away from home, including a dishwasher, microwave, coffee maker, and much more. We also cater to the young with a highchair and booster seat, as well as a pack'n'play. Just off of the kitchen is a large pantry as well as a fully equipped laundry room with washer, dryer, ironing board and iron. You’ll feel like you’re at the movies in our cozy living room with a large 47” LED TV with DVD player and stereo system for your enjoyment. There are also board games for the family on a rainy day and a games room with a large pool table in the front room and table tennis in the garage. On the second floor, you’ll find 4 bedrooms, including 2 masters. The first master suite is extremely spacious with a king size bed set and its own entertainment area with a 26" LCD TV/DVD player. The perfect way to relax and unwind after a day at the parks. There is an en suite bath with Jacuzzi tub and stand up shower as well as an extra large walk-in closet. The second master bedroom has a queen size bed set, a 19" LCD TV and spacious closet. This bedroom shares the second full bath with the other two bedrooms on the second level. Kids will enjoy staying in the double/single bunkbeds in each of the remaining 2 bedrooms which allow 3 to sleep comfortably in each room. Both rooms include an LCD TV and one has a playstation and for your enjoyment. The most enjoyable part of your stay will be around our large, screened in, heated pool and spa. Relax in our comfy lounge chairs by the pool or have dinner outdoors at the patio table. This is a convenient location within easy reach of all the local attractions yet far enough away to enjoy the peace and tranquility of your own pool home. We are from Ottawa, Ontario and we love visiting Florida so much, that we decided to purchase a home there. We've had a great experience renting our home and love to see other families come and enjoy it as much as we do. The location of our home is perfect. It is in a beautiful, quiet neighbourhood, that is close to the grocery stores and shopping and is only 15 minutes away from the Disney Theme Parks. We love to spend a day at the ocean as well and it's only an hour's drive to either coast. We have a gorgeous mohagany pool table in the front room, a ping pong table in the garage as well as a flat screen TV in every bedroom and living room. The house is beautifully furnished with all amenities. Most of our guests love having the free North American long distance phone calls and WiFi. We also have a nice big inviting pool and spa in the backyard that has separate controls for heating the spa only. This is our second time in Orlando and we found Sheila’s house to be exactly what we needed. It’s clean, it’s furniture is a good standard, the layout it great and it has all the amenities that are needed to make your stay very comfortable, the kids loving the pool table especially. I would very much recommend Sheila’s house. We stayed for 28 days and loved it . The house has everything you need . I would recommend to have 1 bigger cooking pot in the kitchen. Sheila has been fast on responding to any emails. Our Kids came and loved the pool with hot tub. The house is Close to stores , Close to Walt Disney if you have small children. We have booked again for next year. R and R. We are a family of 7 and had plenty of room!!! We're so glad you enjoyed your stay! Thank you so much for taking the time to write a review. We hope to hear from you again. We really enjoyed our stay at this property, the home was immaculately clean! Our stay was exceptional, kudos to the owners and their staff. All communications with the owner and property manager was professional and prompt. We would highly recommend this particular property and we will definitely be returning each time we visit Florida. The pool and jacuzzi were without a doubt the most enjoyable during our stay. All the necessary items in the house were provided , thanks again ! This was indeed a vacation to remember!!!! We're so glad you enjoyed your stay and we look forward to hearing from you again. Very clean spacious home in a very convienant location. Kids especially loved the pool table. We had enough room for everyone to relax and enjoy.